Noel Bueza is an acclaimed artist from Lucban, Quezon. He is a full-time artist and is adept in all art media. Yet, it is with the pen and ink that he is most famous for. He draws flower, birds, human figures, old houses, churches, cathedrals and other cultural structures. With such clarity that one will always wonder how he can bring to life these images with just the use of the pen. Noel’s illustrations are meticulous and precise creations of realistic highlights and shadows leading to a 3-dimensional feel of the drawing. His unique artwork adorns halls of many collectors here and abroad. His lifelike ink illustrations are so intricate that they actually blow the art up in size. Capturing an image using pen and ink is one of the most complex endeavors an artist can create transforming thousands of miniature strokes into almost exact depictions of the original. In general terms, pens may include ballpoint, fountain, and markers. As you might have predicted within each of those are countless varieties. Yet, one thing they do all share is the use of ink. As with other medium, ink contains the pigment resulting in a different color. Every pen has different characteristics for the look it provides. From sharp thin lines to marks that bleed across the paper. Artists use pen and ink to achieve results that oils, pastels and other mediums cannot. Pen and ink drawing describes the process of using pens to apply ink to a surface. Drawing with pen and ink allows the artist to create strong areas of contrast. 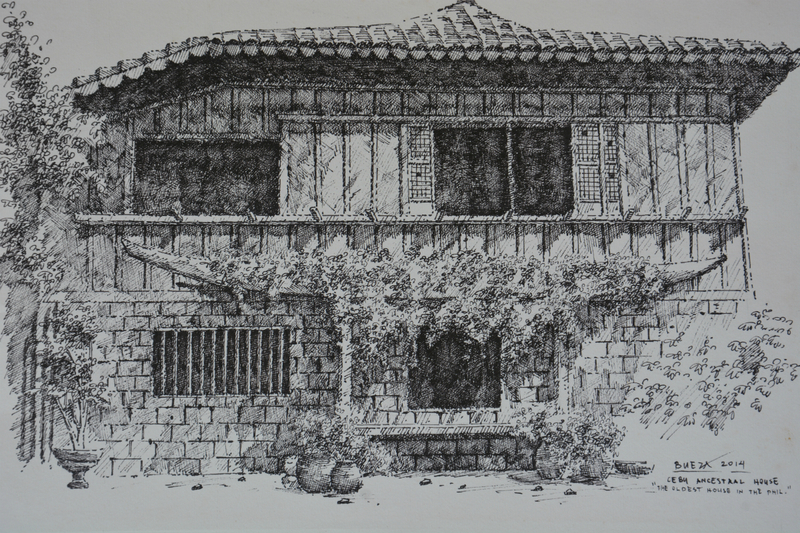 These techniques include hatching, cross hatching, random lines, and stippling. One appeal of drawing with pen and ink is the clean, finished appearance. The “Cebu Ancestral House” depicts feelings of nostalgia and mysticism. It’s like you are looking back in time reliving our illustrious past among ancestral houses.